Bioclinica CTMS is a powerful web-based clinical trial management system for organizations that conduct clinical trials. It’s a high-performance software that creates a way to bring business process workflows, office tools into the regulated world. The platform is one of the most prevalent productivity tool designed to transform any disjointed clinical trial into a cohesive work environment. Bioclinica CTMS is an end-to-end that brings efficiency, control, and quality data to all studies; lets users work on the go; and manage& view real-time operational performance, anytime anywhere. The solution facilitates the bi-directional information exchange to SharePoint and Microsoft assets, thereby reducing duplication and supporting regulatory document routing. Some of its notable features include payment module, eTFM integrations, contact management, native SharePoint integration, robust tracking, monitoring visit report, and extensible standard reports. 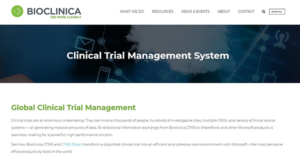 Bioclinica CTMS is a robust clinical trial management system that delivers multiple benefits to boost clinical trial operations and efficiency. It’s an enterprise-class solution that boasts the flexibility and power to facilitate studies of different complexity, sizes, and types in numerous therapeutic areas. This office-smart system delivers superior customer experience and eliminates all the hurdles and frustrations of the conventional hard-coded CTMS software. One of its main benefits is that its supports end-to-end clinical trial management. The platform links the numerous mechanical parts of a clinical trial process and allows you to track the progress from a centralized dashboard. It handles all the operations of a clinical trial from start to finish while maintaining role-based access controls across the band. Bioclinica CTMS offers indispensable tools to plan, kick start, implement, and manage your clinical trial while accomplishing all the regulatory compliance activities. Additionally, Bioclinica CTMS allows you to improve the efficiency of your work and data flow to achieve increased cost savings in labor, time, and operational expenses. It consents you to combine clinical operations with office processes to reduce back-office paperwork and lower administrative overheads. Its unique Monitoring Visit Reports (MVR) suite permits you to view and manage performance across studies and programs in real-time through secure role-based web access. Better still, Bioclinica CTMS allows you to leverage the Microsoft suite which includes SharePoint, Excel, Outlook, Word, Project, and Access. It makes it easy to update, access, report, track, and manage all study operations compliantly and securely. The solution is Microsoft-smart meaning you can leverage the existing Microsoft investments at a low Total Cost of Ownership. If you are considering Bioclinica CTMS it may also be a good idea to analyze other subcategories of Best Clinical Trial Management Software gathered in our base of SaaS software reviews. Every company has different needs and requires an application that can be personalized for their size, kind of employees and buyers, and the particular industry they are in. For these reasons, no system can offer perfect functionality off-the-shelf. When you look for a software system, first be sure what you want it for. Read some Bioclinica CTMS reviews and ask yourself do you need basic functionality or do you want complex features? Are there any industry-specific features that you are looking for? Find the answers to these questions to assist your search. There are lots of elements that you need to mull over and these include your finances, specific business requirements, your organization size, integration needs etc. Take your time, try out a few free trials, and finally choose the platform that presents all that you require to boost your firm competence and productivity. How Much Does Bioclinica CTMS Cost? Bioclinica CTMS doesn’t publish its enterprise pricing information. Contact the vendor for detailed pricing information. We realize that when you make a decision to buy Clinical Trial Management Software it’s important not only to see how experts evaluate it in their reviews, but also to find out if the real people and companies that buy it are actually satisfied with the product. That’s why we’ve created our behavior-based Customer Satisfaction Algorithm™ that gathers customer reviews, comments and Bioclinica CTMS reviews across a wide range of social media sites. The data is then presented in an easy to digest form showing how many people had positive and negative experience with Bioclinica CTMS. With that information at hand you should be equipped to make an informed buying decision that you won’t regret. What are Bioclinica CTMS pricing details? What integrations are available for Bioclinica CTMS? If you need more information about Bioclinica CTMS or you simply have a question let us know what you need and we’ll forward your request directly to the vendor.